Have I mentioned that I love pasta? Seriously, I could eat it every single night for the rest of my life and be quite content. When I saw this recipe posted by Kendall @ Keeping Up With the Joneses I knew I wanted to try it. The recipe is adapted from Cooking Light which you can find here. First, start a large pot of water for your pasta. Next, you'll need to roast your peppers. 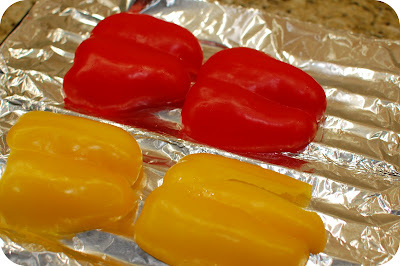 Cut peppers in half lenghtwise; remove seeds. 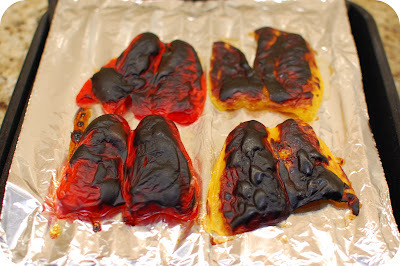 Place peppers, skin side up, on foil lined broiler pan. Place in oven with the broiler set to high. It should take around 12-15 minutes for the peppers to turn black. 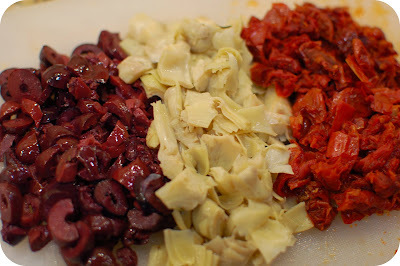 While your peppers are in the oven, chop kalamatas, artichoke hearts, and sun dried tomatoes. Your peppers should just about be done. Peel skin off of peppers and chop. 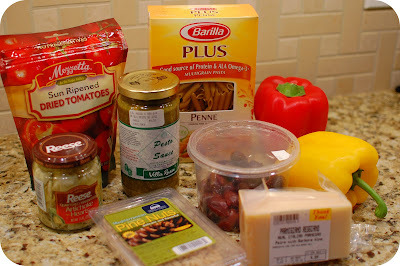 In a medium sized bowl, mix peppers, kalamatas, artichokes, sun dried tomatoes, pesto, and parmigiano reggiano. 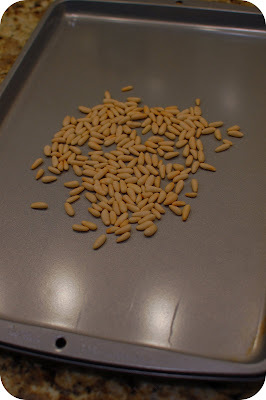 Toast the pine nuts on a cookie sheet in an oven heated to 350 degrees for 6 minutes. 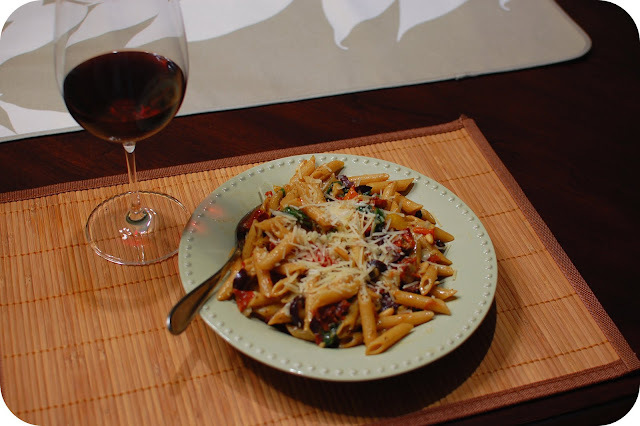 When pasta is finished cooking, drain and return to pot on the stove with a dash of olive oil. I had fresh spiniach on hand so I added a handful to the pasta. As you stir, the spiniach will wilt down. 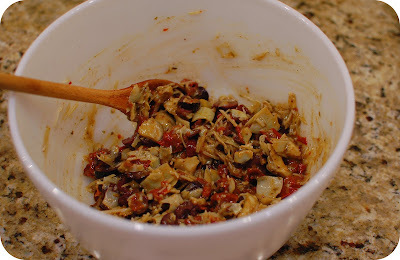 Add your artichoke, pepper, tomato, and olive mixture to the pasta along with the pine nuts and stir until all pasta is coated. Serve and top with additional parmigiano reggiano. I just got a Cooking Light in the mail, and I used to love that magazine! THis looks really good--I'l let you know if I try it. 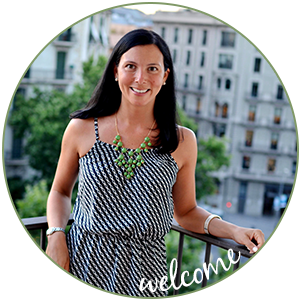 I love that you have so many vegetarian recipes up on your blog. 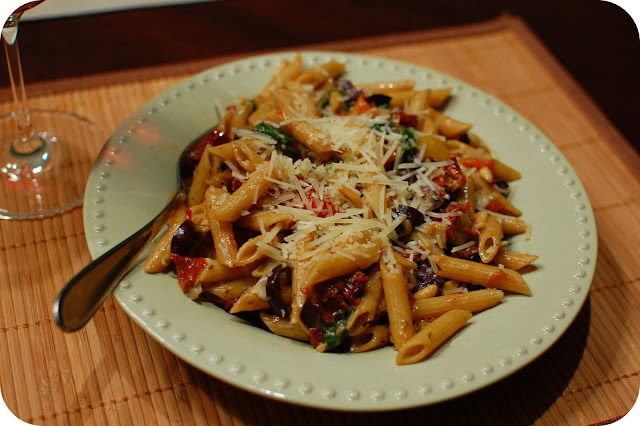 I could also live off pasta alone so I can't wait to try this, it looks sooo delicious! Thanks a bunch, I wrote down all your recipes to try.